After all these years, it's finally happened. I'm making Thanksgiving dinner for the family. Woo hoo! Yippee! Wait a minute...WHAT did I get myself into? Last year, I blogged about never having the opportunity to make Thanksgiving dinner. As someone in the food biz, I view this holiday like the Superbowl of food, and I'm always sitting on the bench. You can read that post/whine-fest right here. So this year, I finally decided that it was time to take the reins. My lovely sister-in-law Laura has hosted dinner the past several years for the whole crew. Laura has a beautiful home and the ability to schedule and plan like no one else I know. She's a natural for this and never seems to sweat even a little bit. But, Laura and family live a few states away and I was hoping to stay closer to home this year. My dad isn't in great health and my brother Todd and his super-duper prganant wife will not be making the trip, so the timing seems right. The fact that my brother-in-law Ed always wants to do a project in our house when he visits had nothing to do with this. I swear. Pinky-swear? As for me, the house is a bit smaller so I'm a little crunched trying to figure out where to put everyone, because this isn't a balance it on your lap kind of meal. Also, I tend to bite off more than I can chew task/menu-wise. I like to show that I really can cook, and try too much fabulousness, thus making dinner late and people grumpy. My own family is not known for gourmet feasts, but more of a homestyle traditional PA-type dinner (gravy on everything), but my husband's family is more adventurous, though I did find out that I am required to serve corn. Okkkkkkkkay. So, for the next 3-1/2 weeks, I will use this space to plan, recipe test, and sort out the details, culminating, of course, in fabulous photos of a wonderful, perfect meal. The first dilemma is this: How do I plan a meal that pleases everyone and can be executed with ease? Planning will be paramount, and I know I'll have to keep myself under control. Right now I'm wrestling with all of the fabulous cooking magazines scattered about my living room with a million different versions of the same type of recipes. I'm actually swooning over the latest issue of Fine Cooking, one of my very favorite cooking magazines, and the spread of sky-high gorgeous cake recipes provided by one of my favorite bakers, Rebecca Rather, the Pastry Queen, of Rather Sweet Shop down in Texas. 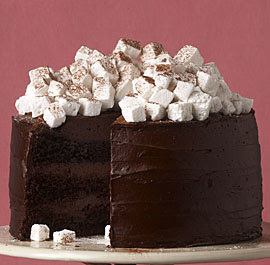 This Hot Chocolate Cake with Homemade Marshmallows has me all a-twitter just thinking about it. My goodness, have you ever seen such gorgeousness???? How do you plan a successful, delicious meal while getting the house ready (time to move my "office" from the living room back to the spare room), making the table look great, and accepting the generous offers of food from family? You just know they will offer to bring something and it's important to say yes yes yes, while keeping things in-line with the meal you want to serve. Plus having other folks bring things? Makes dinner soooooo much easier. Am I right or am I right? So how do YOU do it? How do you make a great meal and keep everyone happy? What's your trick? Your tip? Your surefire way to keep it all movin' along. I think I just decided to throw out the apple and pumpkin pie recipes for Thanksgiving and go with the Hot Chocolate Cake with Homemade Marshmallows....that looks AMAZING!